Speedboats are more fun, right? Well, they are certainly more agile, just like Jeff Barrett. 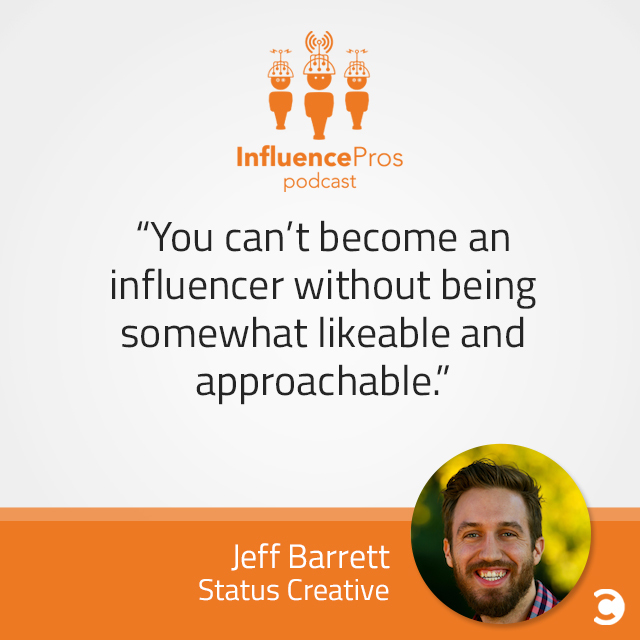 Jeff dives deep and bares it all as he delves into the impatience that drove him to become an entrepreneur, the growing role PR is developing in partnership with influencer marketing, and the long-term planning and approachability that has helped him maintain and grow relationships that can be leveraged effectively. Status Creative is a proactive PR agency driven by the desire to inspire memorable moments, stay authentic, and strive for excellence in all ways to ensure lasting growth for all their clients. Would you rather win the Nobel Prize but not the money that comes with it, or would you rather receive the $1.2 million that comes with the prize but get no recognition? I think I’d take the $1.2 million. Accolades are nice, but if you’re doing good work, they’re going to come to you either way. They help, but I am in this to get paid. Would you rather not shower for a month, or not sleep for a week? I can’t not sleep. I’m not going to shower for a month. If that means that I have to pull a Howard Hughes and just stay in a room, so be it, but there is no way I am going a week without sleep because I can’t function. Would you rather be able to have perfect vision in the dark, or the ability to see through walls? Of all the questions, that’s the hardest one for me. I’ll say I’d rather see through walls.